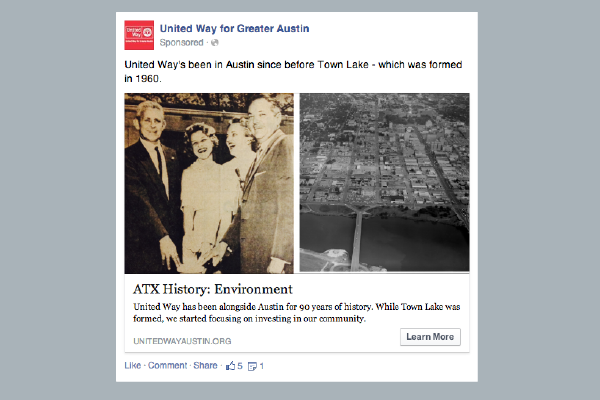 This year, United Way for Greater Austin celebrated 90 years of making Austin greater – the locally-run chapter started in Austin in 1924. The anniversary presented an opportunity to tell our rare story and a challenge to do so in a new way. 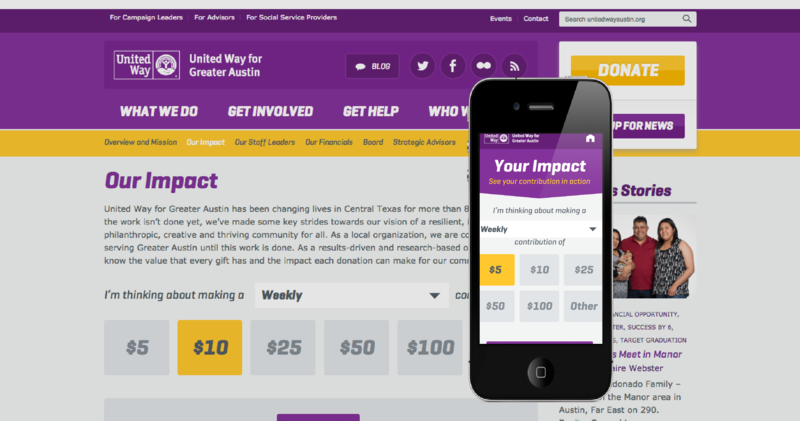 To recognize this key milestone, UWATX wanted to create an online experience to draw in new audiences and delight existing ones. 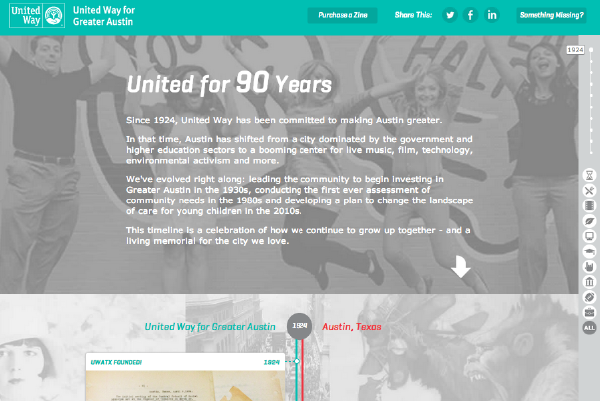 Create a responsive timeline highlighting UWATX and Austin history: Working with a design/developer, we created a dual timeline that both showcased our own history but also told the story of how Austin has changed as a community through nine decades. We used the timeline as the center of our 90-day celebration by also highlighting the anniversary with intro text at the top and featuring our zine and photography project as well. 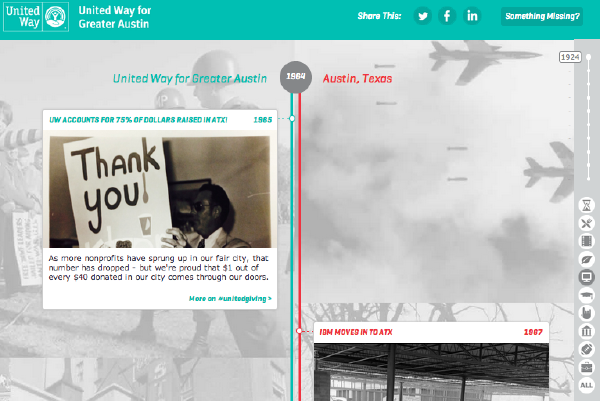 Fill the timeline with extensive, rich content: The timeline includes 200+ highlights in Austin and local United Way history, all researched and written by internal staff. In addition, most posts include a photo (with Creative Commons or Public Domain license) or YouTube video and a link to learn more. 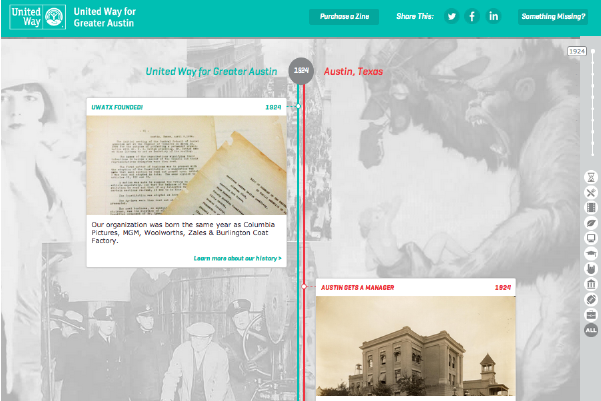 Rather than providing a list of events, we wanted users to be able to dive in to Austin history. Promote extensively across all channels: To kick-off the 90-day celebration, we reached out to our universe of subscribers via e-mail (approx. 20K individuals) to let them know about the timeline and featured it in some way each month in our e-Newsletter during the campaign. We also posted on our Facebook and Twitter channels throughout the campaign, highlighting a specific event or specific category from the timeline, and drove traffic from targeted interest groups to the category pages with Facebook advertising. Finally, with the help of our PR firm, we implemented a Pinterest strategy to highlight particular events on the timeline. Content should be useful: As more and more brands embrace their roles as content creators and publishers, audiences are bombarded by selling messages. To cut through the clutter, brands must not only tell compelling stories, but ones that add value for their audiences and that users can see value in sharing – content that has youtility. We could similarly cut through the clutter by producing content that was useful to our audience, while also highlighting our own story. We are not the star of anyone’s movie…but Austinites LOVE their city: While 90 years is a significant hallmark for an organization and a badge of honor that few attain, we recognized that it wasn’t inherently or deeply interesting outside of the organization. 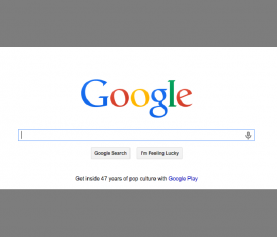 The challenge became how to create content that was engaging beyond that simple fact. To solve that challenge, I reviewed and analyzed quantitative data from other content marketing efforts that confirmed a completely unsurprising fact: Austinites loved sharing and clicking on content that reflected the city or our unique culture. 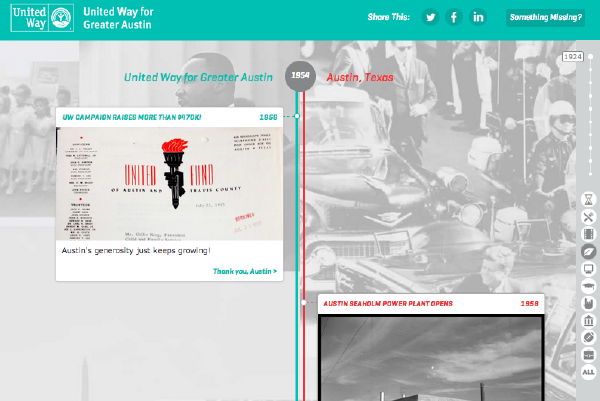 By including UWATX history alongside Austin history, we could create something that was interesting to users regardless of their relationship (or lack thereof) with UWATX. 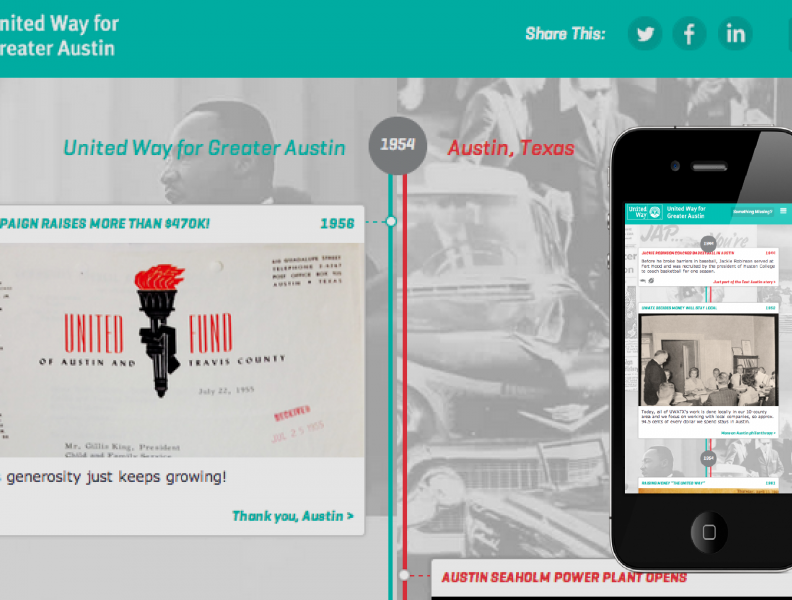 A timeline of Austin must reflect its diverse interests: When we started, the goal was to include approx. 20 or so events to tell a simple story about our city. As I researched and reviewed content with our internal team, the list kept growing as all of us wanted more information on different aspects of our history. We realized that each of Austin’s diverse communities – film makers, foodies, musicians, techies, environmentalists, etc. – had a unique history and, in order to make the timeline as useful as possible, we needed to consider all of these unique histories and make it possible for users to select only the one they wanted to engage with. During the initial 90-day campaign, the timeline drove an additional 10 percent of traffic to our website above our normal traffic. Of this traffic, 72 percent of this traffic came from new visitors versus site average of 67 percent. After launch, the timeline immediately became (and has remained) the second most visited page on the site each month – second only to the home page. 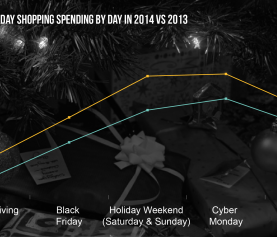 Users also average twice as much time on the site when visiting the timeline. To date, 2-3 other organizations have followed up to create a similar timeline including the Corporation for National and Community Service and a child care advocacy consortium funded by the Annie E Casey Foundation. 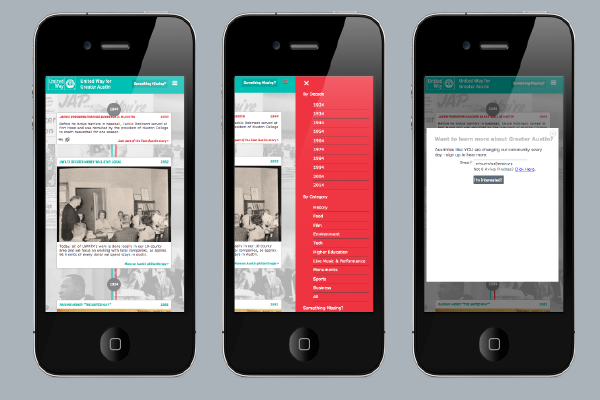 The timeline succeeded in meeting initial content goals of engaging existing users and attracting new visitors. Within a few weeks, we determined that this success could further be leveraged with a more obvious call-to-action to convert new visitors, so we implemented a modal window pop-up to collect email addresses. More iteration needs to be done to refine this process and add other ways for new users to become engaged, such as easier social sharing. 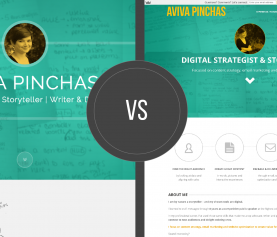 Aviva Pinchas is a digital strategist looking to help brands tell their stories and connect to customers. 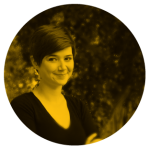 Her expertise focuses on optimizing email, web and content experiences to delight customers and meet brand goals. Digital strategist with broad experience across platforms & disciplines looking to help brands tell their stories and connect to customers.